oh…… what to do with those luscious, juicy, colorful tasty tomatoes. 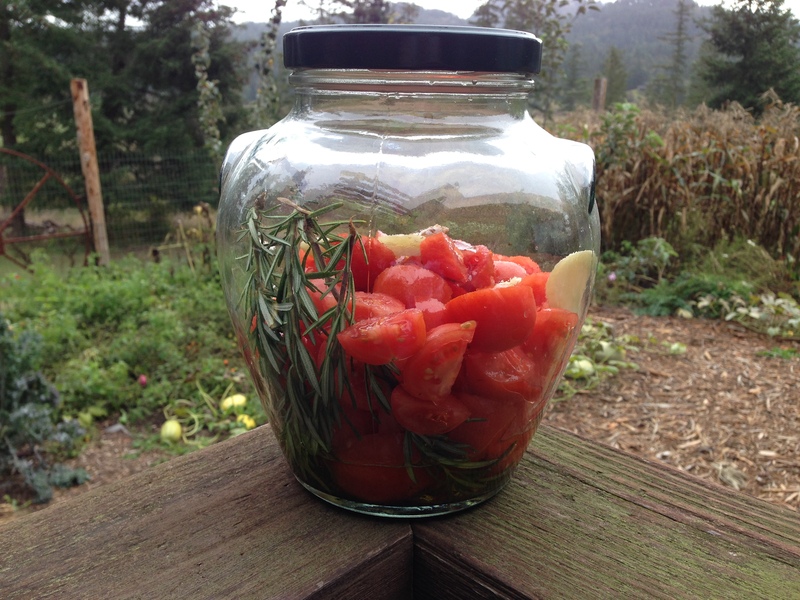 Here are 4 easy recipes to preserve your summer harvest. coarsely and dump into a large jar. Mash a few garlic cloves (I like a lot of garlic) add to jar. Add 1 cup of olive oil and a dash of balsamic vinegar. If you don’t have vinegar, use lemon or lime juice. The better the quality, the better the flavor on both oil and vinegar. Add sea salt and ground pepper to taste. If you have fresh basil, oregano, rosemary or thyme, tie up in bunch and toss in too. Put the lid on; shake the jar to mix contents, set in the sun or hot sunny window. Let sit to soak up the heat of the sun for 4 hours (can do longer time, do not recommend shorter time). Pull herbs out. Serve with crusty bread or use as a light raw sauce for pasta. I blended my jar contents and warmed in a cast iron skillet, spoon over ravioli, top with shaved parmesan cheese. You can freeze or keep in refrigerator for up to 1 week. Homemade Tomato Paste- Maple Rock’s Farmer John-Take your split and over ripe toms and cook them down in a pot to the point that you can macerate them with a potato masher or even a stick blender if you have one. After mashing them, run them through a food mill to remove the skin and seeds (I skipped this step). At this point you have a watered down sauce (sometimes I’ll drain off some of that liquid prior to mashing). Transfer the sauce in the pot onto the biggest sheet pans (I used cake pans) that will fit in your oven and cook it down for one hour at 350 then take it down to 250 for another two- three hours. Stir occasionally and add some nice olive oil and salt to taste. We like to make as big of a batch of this as we can and freeze it in pint jars not quite filled to the top. Keep one in the fridge all the time to add to just about anything you can think of. 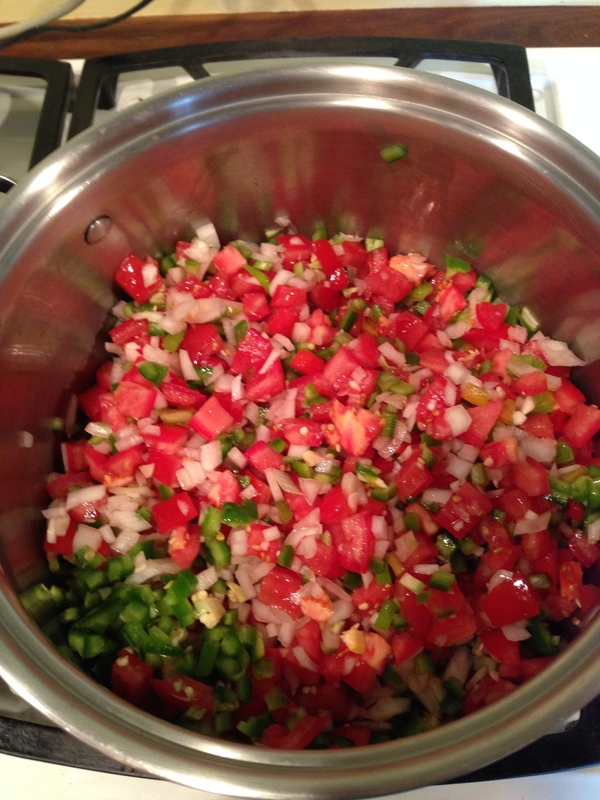 10 cups chopped tomatoes (I include skin and seeds, can remove if desired) about 6 lbs. 5 cups chopped green bell pepper, seeded. About 2 lbs. 5 cups chopped onion (you choose type, I use Walla Walla) about 2 lbs. 2 garlic heads. (can vary dependent on your taste, however, too little is not good). Chopped and combine all ingredients (EXCEPT CILANTRO). Place in large saucepan. Bring mixture to a boil. Reduce heat and simmer for 10 minutes. Add cilantro. Ladle hot salsa in prepared jars, leaving ½” headroom. Cover with seal/screw top. Process 20 minutes in a boiling water bath. Can be done any time of the year! above and am tired or ran out of jar space in the pantry. 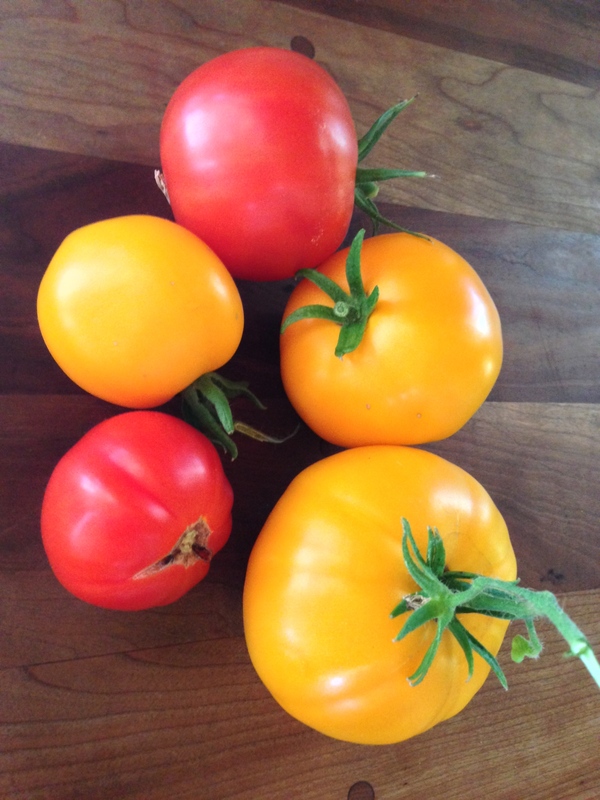 Clean tomatoes, cut stem and blemish/bad areas away. Slice the tomatoes about 1/8” thick. This is a guideline. Too thin, they come out crispy, too thick, they come out chewing and are more likely to mold in the jar. Coat the trays with a non stick spray or rub with olive oil to keep slices from sticking to the tray. Place slices on tray, leaving room around the slices so they have air circulation around all sides. Set dryer on 135 degrees for 5 hours. The timing can vary, checking every two hours until dried to your preference (close to potato chip crisp). 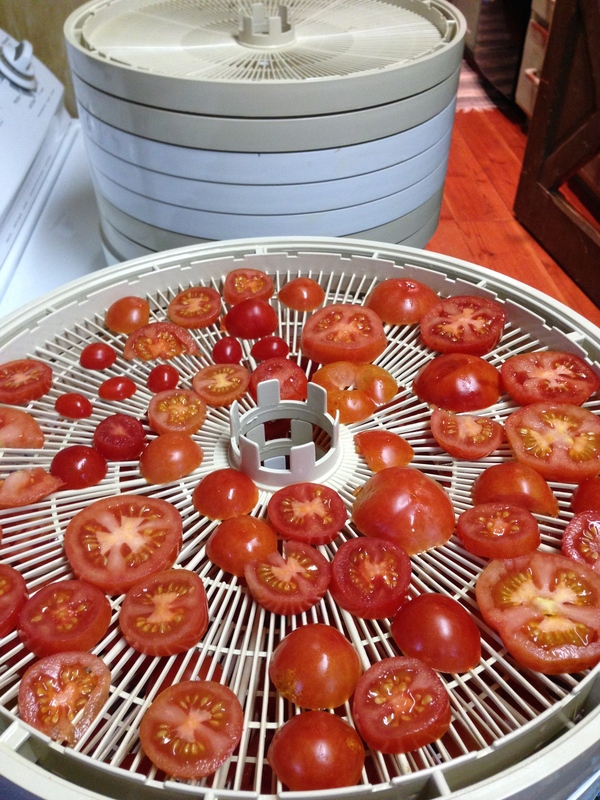 Turn off the dryer and let tomatoes cool completely. Store in an airtight jar. Great to eat as is, or add to quiche, soups or sauces for a strong tomato flavor that will delight your taste buds.